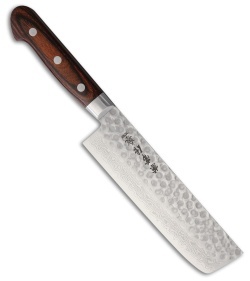 Popular in Kyoto, the Usubagata kitchen is a dominant vegetable knife sure to get loads of use in your home. Made from 17 layer Damascus steel with a VG-10 core, the blunt tipped Usubagata quickly minces, slices and dices with it's long slightly curved cutting edge. Beautiful Mahogany handle scales elevates fingers above the cutting surface for plenty of control and comfort. The attractive Tsuchime hammered finish helps prevent food from sticking to the blade, while providing an elegant visual affect.